Biker Stereotypes - Are They Unfair to Modern Motorcyclists? Do Biker Stereotypes Cause Us to Unfairly Blame Motorcyclists for Accidents? There is a certain stereotype regarding motorcycle riders which designates all of them as reckless, wild and crazy riders who automobile riders are forced to share the road with. In truth the actual number of “bad” bikers is very small, with somewhere around one percent actually fitting the stereotype of the Harley rider. Unfair as the stigma may be, bikers themselves tend to perpetuate the myth. They install loud pipes on the bikes, and dress like the dangerous movie character bikers modifying their motorcycles to go along with the stereotype. Further, because motorcyclists often ride in groups, it furthers the perception of the high number of wild-driving bikers. But are these biker stereotypes causing us to assume the motorcyclist is to blame in a single bike accident? There is a wide range of diversity among motorcycle riders and you will find every age and every profession driving a motorcycle and many times the motorist who finds himself or herself in trouble on the highway ends up receiving the help they require in the form of a motorcycle rider. Most motorcycle riders are even more conscious of safety than ever before. Many riders are taking motorcycle safety courses and receiving extended training in order to receive their motorcycle license. The clothing typically worn by motorcycle riders has even improved through the years through helmet standards and more protection in their leathers, gloves and boots. Unfortunately, insurance companies and juries tend to automatically pin the blame for the accident on the motorcycle rider without benefit of the actual facts. Far from being reckless bad boys with a death wish, accident statistics prove that the majority of car/motorcycle crashes are caused by automobile drivers and even many single bike accidents are actually the result of actions of the driver of an automobile. 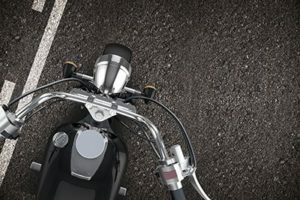 In many cases of single bike accidents, the negligence of the automobile driver is directly responsible for the single-bike motorcycle accident. Drivers may be inattentive due to talking on their cell phone, fiddling with the radio or CD player, chatting with other passengers in the car, eating, or disciplining the children in the back seat. This inattentiveness can lead a driver to veer into the other lane, sending a motorcyclist careening off the road in an effort to avoid a head-on collision with a car. In other instances, an auto driver can come up on a motorcyclist too fast, again causing the rider to be forced off the road, and potentially into fixed object. Auto drivers will often change lanes without being cognizant of the motorcycle rider in the neighboring lane, or will back out of a driveway or parking lot, never seeing the motorcycle. Even when the motorcyclist is not hit by the car, they are required to take evasive action to avoid a collision, which often leads to what appears to be a single bike accident. The car drives away, leaving the motorcyclist injured and with a damaged bike—and no one to assign blame to. If you or someone you love has been injured in a single motorcycle accident, you may not truly be to blame. Unfortunately, insurance companies are usually very hesitant to believe the motorcyclist and they may unfairly deny your claim or offer you less compensation than you deserve. Contact the experienced Colorado Springs car accident attorneys at the Green Law Firm today to schedule a no-obligation consultation and discuss your case. Call us today at 1-719-694-8515. By webadmin|2016-11-01T15:58:56+00:00October 31st, 2016|Biker Stereotypes, Blog, Colorado Springs, Motorcycle Accident|Comments Off on Do Biker Stereotypes Cause Us to Unfairly Blame Motorcyclists for Accidents?